Our industrial paper rewinding machines and roll paper slitting machine are usually custom designed and are very much different from regular machine which are available in market. 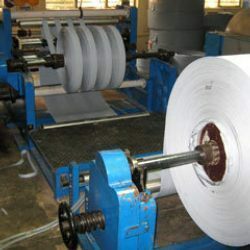 We design every machine to suit our customer's requirements and these industrial paper rewinding machines and roll paper slitting machine are used to slit tough materials like P.E, aluminum coils, stretch material & thick papers. Variable speed motor to control the speed, Available in different sizes, these machines can also be customized as per the specifications detailed by the clients. Looking for “Paper Rewinding Machines”?